We offer comprehensive and flexible accounting, tax and finance services while supporting our clients' value-creation. Taking on challenges while protecting oneself is necessary when managing a business. Of course, no companies are perfect at doing everything. Therefore, it is important to have a clear idea of what your company’s strengths and weaknesses are and manage them. Accounting and tax services are a ‘protective’ function of a company or business. Our mission is to enable companies to grow by supporting this ‘protective’ element. All business owners and leaders we work with today make Japan’s economy tomorrow. Our desire is to contribute as much as we can to Japan’s future. Accounting and tax services are formed through the building-up of lots of little things. We focus on attention to detail and respect in our service so that all elements can be processed with no missing information or flawed paperwork. Clients are conducting their businesses in an unstable economic situation with a constant information flow. We walk together with our clients at their speed and take care of their needs for them speedily. We carry out our work with a sincere focus on our daily improvement so that we can offer even better services to satisfy our clients. We also take care of other necessary services over and above from the above. Please feel free to contact us to discuss your needs. She graduated from Chuo University’s Commercial Science faculty. 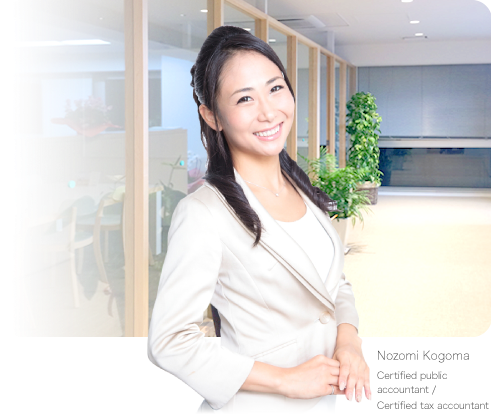 She is a certified public accountant and a certified tax accountant. She passed the certified public accountant examination during university. She worked at a division of the legal audit team at Ernst & Young ShinNihon LLC where she engaged in legal auditing of listed companies in the manufacturing, information and communication and sales management industries among others both in Japan and overseas. She made a career change to an investment fund operation company that Mitsubishi UFJ Morgan Stanley has a stake in and engaged in business and industry analysis, formulation of business plans and formulation of investment schemes. 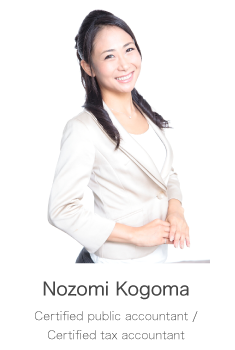 After working at an accounting firm, she established Nozomi Kogoma Certified Public Accountant Office. Resigned from Palace Capital K.K. Our company collects your personal information under the following circumstances. Our company does not provide and disclose personal information collected from our clients to third parties. The only exceptions to this is one of the following circumstances. Our company will conduct work on disclosures, amendments and removal of personal information from the applicant themselves. Copyright© Nozomi Kogoma C.P.A., All Rights Reserved.